If there has been any MUV that has won the hearts of Indian customers, it has been the Toyota Innova. The Innova has been the japanese manufacturer’s best seller in India. Though being priced at a premium to its competiton, the Innova took not time in becoming a favourite and a preferred people mover. Comfort, space, reliability and many more factors helped it become a best seller. New Toyota Innova Crysta 2017. This vehicle is now better on performance, features, fit and finish and also space. Toyota has once again set a benchmark with the Innova Crysta. Now it is upto the competition to catch up. It has once again started to sell in large number despite the hike in price. That shows the level of confidence that people have in the Toyota Innova brand. We review the Toyota Innova Crysta in detail and tell you whether it is worth buying. Read on further. Toyota Innova Crysta On road price starts from 13,47,553/-. Check for price details of Toyota Innova Crysta in CarzPrice. The new Innova Crysta like we already mentioned looks sharper and edgier than before and if you ask me this people mover is also previewing Toyota’s new designs language which can also be seen in some of their recent products as well. Talk about swize and the new generation Inoova Crysta is wider as well as longer than its predecessor which in turn has created more room inside the cabin.Towards the front the Innova gets wraparound headlamps which gets integrated projector and LED units . Apart from the new headlamp unit the front profile also gets massive grille with chrome laden slats. The long front hood also gets some edgy character lines as well. The side profile however looks simple but the new ORVM’s gets integrated side indicators and the huge glass area towards the side profile helps even the third row passengers to get proper view of their surroundings. The highlight of the side profile however is the diagonally cut D pillars.Walk towards the rear profile and you will greeted with the double layered completely new wrap around taillamps.The rear profile also gets an integrated rear spoiler as well which gives this massive vehicle some sporty appearance. There is even a shark fin antenna towards the rear roof area. Lastly the rear deep opening tailgate completes the overall look of the new Innova Crysta. The rear tailgate also gets the Smart Close back door system which automatically locks the door once it has been released.Overall Toyota has gone for the grand tourer type styling on the new generation Innova and it definitely looks impressive and much more modern than its predecessor. The Toyota Innova has grown in size and gets a new frame but is also heavier now. In the early days of the Innova, people worried about the dimensions of the car as it was called too big for the city. The new one is even bigger and thus less maneuverable. 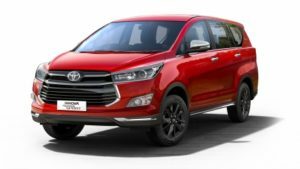 Still underpinned by a body-on-frame platform with the steering still being a hydraulic unit, the Innova feels heavier to drive than before as the steering is on the heavier side and requires effort at low speeds, taking u-turns can be taxing. It does weigh up decently at high speeds but there is still a lot of slack in the straight-ahead position. There is very good stability as you cross triple digit speeds, the Toyota Innova Crysta holding its line well on our not so perfect roads. The car also gets what Toyota likes to call ‘aero stabilising fins’. Without doubt, the biggest improvement has come to the ride quality of the vehicle. The work on the suspension is immediately apparent as this MPV rides beautifully even on bad roads. Bumps are absorbed very well and that’s inspite of the firmness at low speeds. Vertical movements are very well controlled and as you up the speed, the flatter ride only becomes better. There is quite a lot of body roll though but the Innova handles quite well for its weight and size. The brakes have good stopping power. The Innova Crysta has gone on sale at a price range of Rs 13.84-20.78 lakh (ex-showroom, Mumbai). Yes, that puts it out of the realm of conventional MPVs from Maruti, Honda, Chevrolet, Mahindra and Renault and almost into the territory of seven-seat SUVs and even executive sedans. When you’re paying this much money, you have certain expectations of space, quality, luxury and comfort, and the good news is the Innova Crysta delivers on just about all of them. Sure, refinement is still not the greatest, and the steering, clutch and gearbox can get a bit tiresome in traffic, but these are minor setbacks in the scheme of things. The Crysta takes all the old Innova’s strengths that customers just love, and amplifies them. Yes, you will have to pay a premium for it, but as most owners of the previous car will tell you, it will be worth it.